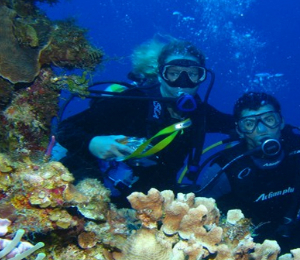 Here at Scuba Dive Bahamas, we believe that everyone who wants to should be able to go scuba diving. This is why we offer the Dive in a Day scuba diving package. These beginner’s packages are sometimes called Learn to Dive or Discover Scuba or Resort Courses. Whatever the name, the point is the same - guests will learn the basics of scuba diving alongside a trained dive instructor and then they will get the chance to go on an actual scuba diving trip at the coral reef! The Discover Scuba Diving Beginner’s course in Nassau Bahamas will take you out to one of the beautiful coral reef gardens of the Bahamas. The tropical islands of the Bahamas are surrounded by a vast expanse of underwater ecosystems made up of coral rock formations. Among these corals live hundreds of unique marine species of animals, ranging from all kinds of brightly colored reef species to turtles, stingrays, lobster, and much more! The Discover scuba diving package begins with a short instruction course in a pool. Here, you will be taught by one of our trained Dive Instructors on how to use scuba diving gear, including the BCD, regulator, and mask, fins, and snorkel. After the instruction course in the pool, we will take a short break for lunch, and then meet back at the dive shop. Then, it’s time for the real fun! We will climb on board our dive boat and start heading out to sea, where we will stop on top of one of the best coral reef destinations for shallow water diving. Alongside your instructor, you will jump in the water with all your scuba gear and swim among the beautiful display of the coral reef. This is an experience that is sure to be one of the highlights of your visit to the Bahamas! All the instruction and scuba diving gear is included, and we even give you a small break on the price if you are coming with friends! Our shop is located a short cab ride away from the cruise ship dock, right in Downtown Nassau. If you want to do more diving than just one, we will gladly take you out on our morning dive the following day, where you can dive at two more dive sites next to your instructor! Can this activity begin in the Afternoon? Yes, we can do a 2PM departure for this course and condense it even more to accommodate divers that are not available for the 9AM start. 9AM is always more preferrable. Call our office for details. Is there photo or video provided for the dive? A dive DVD is available for purchase for every dive. Please notify the dive shop that you are interested in this upon arrival. Can I do more than just one dive? Yes! If you complete the Discover Scuba Diving course, you are welcome to join us the following day for two more dives with your instructor. Pricing for the second day of diving is $189 for single divers, $185 per diver for pairs, and $179 per diver for groups. I have been to the Bahamas many times, but Nassau Discover Scuba Diving Beginner's Course is one of my favorite trips! It includes everything that everyone should do here. As a Bahamas veteran, I can say only the best about this experience!